Do we have a big enough goodie bag to fit this? 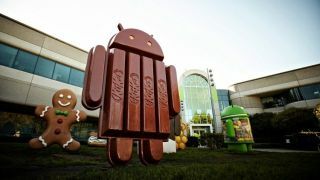 Kit Kat bars may be on your mind all October long, as Android 4.4 KitKat along with the Nexus 5 phone are rumored to be announced on Oct. 14, a little more than two weeks ahead of Halloween. Google has yet to confirm the Android 4.4 features list or release date outside of "October." However, anonymous tipsters are trying to fill in the blanks, indicating that the firmware update is destined for both newer and older phones, according to Ausdroid. The site's sources are also saying that there's a new notifications widget on the way along with fresh animations, APIs and gallery visualization tweaks. This report, if true, would be excellently timed pre-Halloween buzz for Kit Kat-maker and new Google promotional partner Nestle. Nexus 5 on Oct. 14, too? The Oct. 14 announcement would also be good news for owners of the last phone that Google designed, the LTE-less Nexus 4. That's because the LG Nexus 5 is supposed to be a 7-band LTE device that supports the higher data speeds its otherwise stellar predecessor lacked. This bit of information comes from recent a FCC filing for a phone with the codename D820. Photos in the documents match the supposedly leaked mysterious Nexus phone seen during the unveiling of the Android KitKat statue on Google's lawn. The filing also points to a smartphone with a roughly 5-inch display (measured to be 4.96 inches in the FCC report) and a Qualcomm Snapdragon System-on-a-Chip. While the FCC documents point to hard evidence of a incoming smartphone that looks and sounds a lot like the Nexus 5, the KitKat and phone's release date, as sweet as it is, should be taken with a grain of salt. Read about the Google Chromecast being back in stock.